Two recent air and land Master of G watches get the black and gold treatment with the G-Shock GR-B100GB-1A Gravitymaster and the G-Shock GWG-100GB-1A Mudmaster. 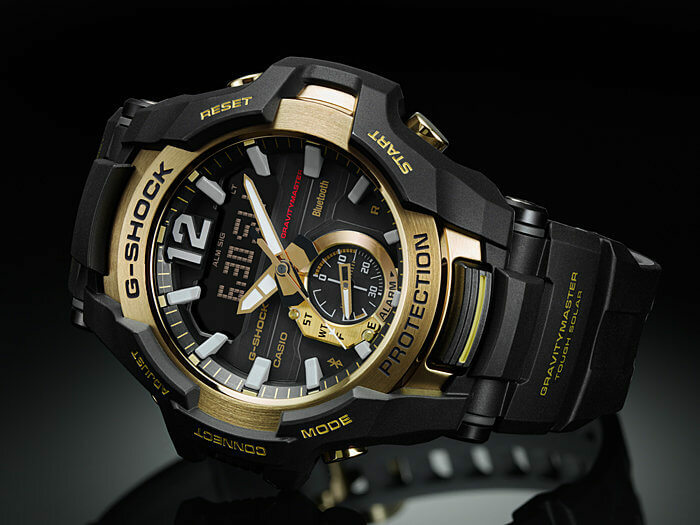 The GR-B100GB-1A has a black dual-layer resin band with a gray inner layer and a gold IP treatment on its stainless steel bezel and buttons. 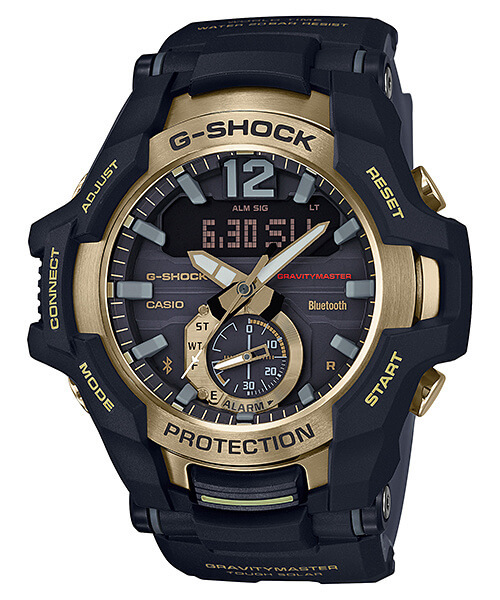 The GWG-100GB-1A has a black resin band and a gold IP treatment on its stainless steel dial ring, buttons, and front screws. 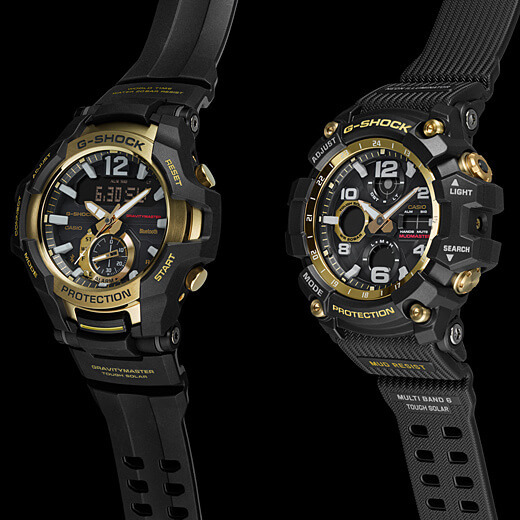 The GR-B100GB-1A is based on the recently introduced GR-B100 Gravitymaster featuring Bluetooth mobile link and Tough Solar power. The G-Shock Connected smartphone app provides many features such as the flight log function with point memory, automatic time adjustment 4 times per day, world time with 300 cities, automatic time zone and DST adjustment, alarm/timer setting, phone finder, and battery level display. 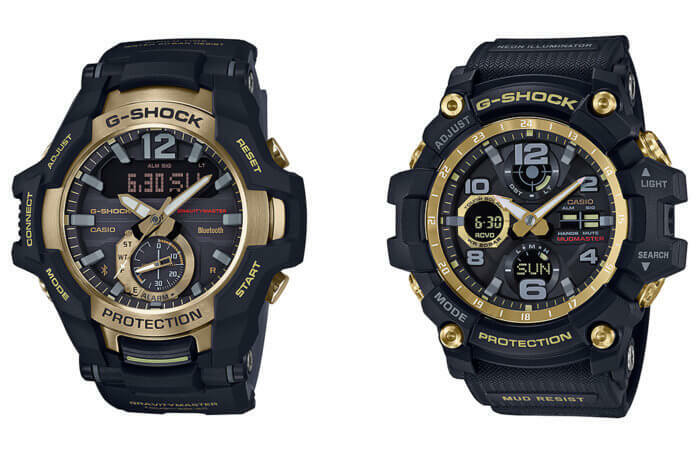 Other features include a 1/1000 second stopwatch (24 hours), countdown timer (24 hours), 5 alarms, and full auto double LED Super Illuminator light. 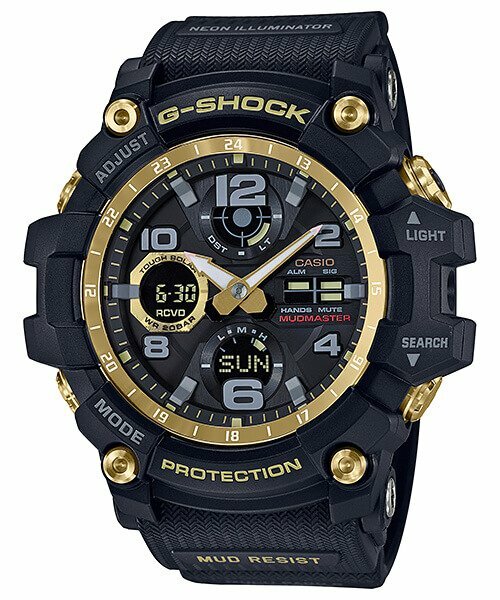 The GWG-100GB-1A is based on the dust-and-mud-resistant GWG-100 Mudmaster featuring Tough Solar power and Multi-Band 6 radio wave automatic timekeeping. It is also equipped with full auto dual LED lights with the Neon Illuminator blacklight LED for the hands and markers and Super Illuminator LED for the LCD displays. 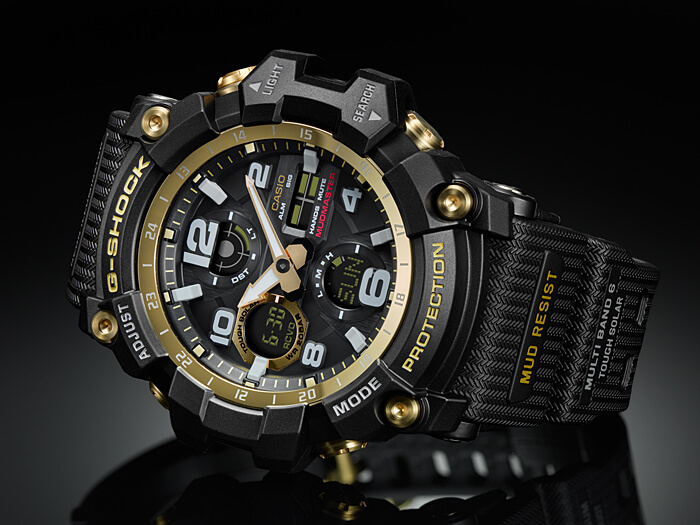 The GWG-100 is a slightly smaller (56.2 x 54.9 x 17.3 mm) version of the original GWG-1000 Mudmaster without the environmental sensors.